Description : A medium-sized dioecious tree grows up to 18 m tall with single stem and wide spreading crown; bark grey mottled, irregularly spotted and freckled; leaves compound, consisting 7-10 paired leaflets; both male and female flowers dark red, bloom into spiky, delicate flowers of pink, lilac and white; fruits oblong size; ripen fruits have light yellow skin with white flesh; seeds brown and hard walled; flowering season September to November; fruiting season December to March. Distribution : Indigenous to sub-Saharan Africa, Southern Africa, West Africa, and Madagascar. Parts used : Fruits, bark. Phytochemistry : Fruits contain vitamin C, amino acids, fatty acids (oleic acid, linoleic acid, alpha-linolenic acid, palmitic acid, stearic acid and arachidonic acid), minerals (Mg, Zn, P, Cu and Fe); fruit nuts contain proteins; bark contains tannin, epicatechin 3-O-gallate, quercetin, myricetin 3-O-α-L-rhamnopyranoside, quercetin 3-O-arabinoside and kaempferol pentoside. 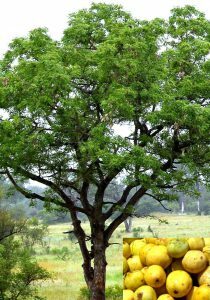 Uses : Fruits edible, rich source of vitamin C; used to make Amarula (cream liqueur); fruits also cooked to produce jam, juices and alcoholic beverages (beer); marula oil used in cosmetics; bark used in dysentery, diarrhoea, rheumatism, and insect bites, also used in malaria prophylaxis, intestinal disorders, and indigestion; leaves used for abscesses, spider bites and burns.